Gold has broken down from the trading range it has been in since late June, breaching key support at $1320. It could have gone either way but a break down is not surprising given the extended COMEX speculative long position that has been hanging over the metal for the past two months. If gold had broken higher, it would only have delayed a correction that was long overdue based on previous bull market history. The top of the trading range was set on July 8 with a close of $1367. At the bottom end of the range, gold bounced off the $1320 level more times than you can count, showing good resilience that is one of the hallmarks of a bull market. Most other markets have corrected their post-Brexit reactive moves and now it appears to be gold’s turn. It doesn’t help that the U.S. dollar has broken to a new four month high above its 200 day moving average (dma). Where does the correction end? Probably at the 50 dma around $1285; that’s the typical support in bull markets. (See chart below). How long does it take? I would guess a month. Why so long, you may ask? If you look over the history of the last gold bull market from 2001 to 2013, most corrections lasted around two months. But the fundamentals supporting gold are strong, there is growing interest in the metal and declining confidence in central banks so this one should be shorter than most. Gold stocks have consistently outperformed gold over most of 2016, another sure sign of a gold bull market. Therefore, expect the correction in gold stocks to be much greater in percentage terms than gold itself. The key support was at 29.40 for the GDX, an ETF of large gold stocks. This level was broken today after repeated tests over the past week or two. Corrections in the prior bull market from 2001-2011 following multi-month advances of 100% or more for the major gold mining indices typically lasted two months or more although I expect this one to be shorter as noted above. Most corrections during a bull market in the miners historically tend to take 25 to 40 percent off the top of the major mining indices. This sort of move will present an amazing opportunity to load up, but you need to be patient. I expect the gold stocks to give ground grudgingly. This is a bull market; investors don’t just give up and run on the first decline and let the stocks collapse. They will try to find “levels” and buy the dips. Most new gold stock bulls think selloffs are shallow one day affairs because that’s all they’ve seen in 2016. 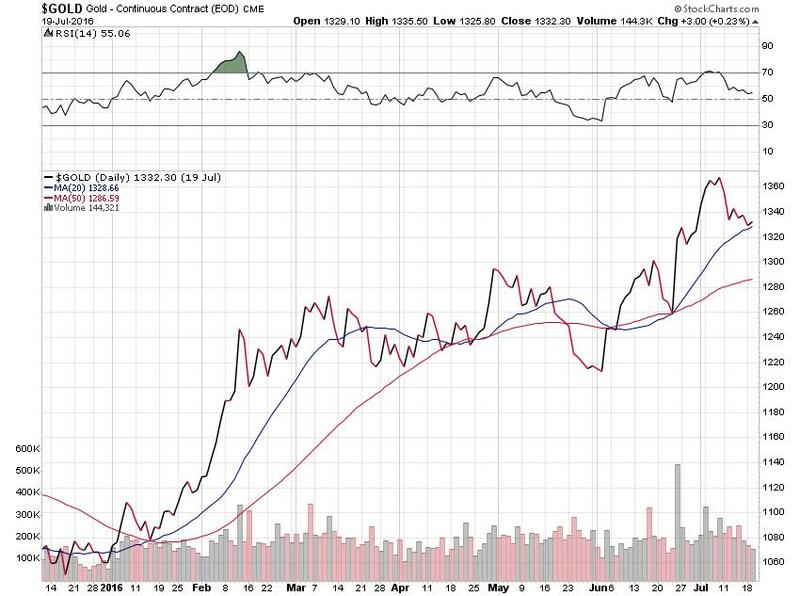 Some bulls have even come to believe that gold stocks only go up and never down. It’s quite the change in crowd psychology from February-April when bulls feared every uptick was merely the prelude to a sudden beating. That change in psychology unfortunately means that a correction is needed. Nearly a month’s worth of trading gains have turned into losses in the miners in less than a day, suggesting this slide is likely to be the real deal. Get those buy tickets ready, but I’d be very patient. If this is the beginning of the kind of correction I think it is, it’s just getting started. Previous Previous post: Why are stocks going higher?